ICDS Kadapa Anganwadi Helper jobs: YSR Kadapa District Women and Child Development Dept released a huge notification for the available Anganwadi Helper, Anganwadi Worker and Mini Anganwadi Worker Posts. There are total 373 Anganwadi jobs in this Kadapa District ICDS Projects. 10th class or 7th passed candidates can apply for this Anganwadi jobs. Application in a prescribed format only accepted for this Kadapa District Anganwadi Helper, Worker jobs. Download the application form from the official website of www.kadapa.nic.in. Candidates selection will be based on qualification and other social criteria. Last date to submission of application form is 15-02-2019. 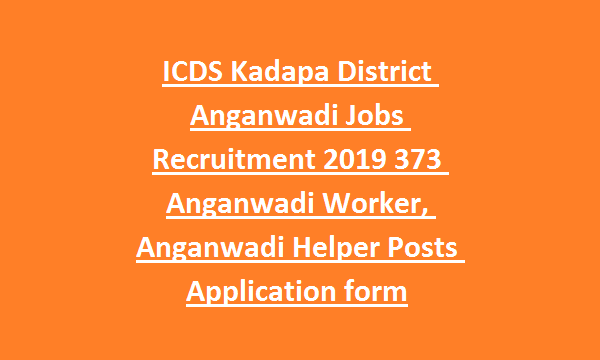 Mandal or Division wise vacancies, post wise vacancies and other details are updated below for this Kadapa District Anganwadi Helper/ Worker Posts recruitment 2019. 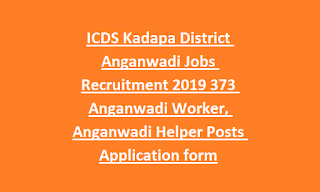 There are total 373 Anganwadi Jobs in this Kadapa District ICDS Projects recruitment 2019. Only married women are eligible to apply for all the posts. As on 01-07-2018 age limits are 21-35 years.